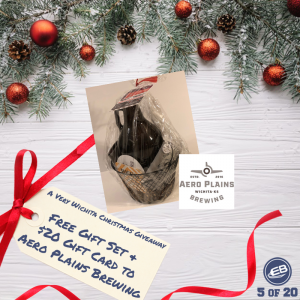 A Very Wichita Christmas Giveaway: Gift Set to Aero Plains Brewing – Wichita By E.B. Welcome to day five of Wichita By E.B.’s A Very Wichita Christmas Giveaway! For three weeks in the month of December, we will be giving away all sorts of fun goodies from gift cards to free dinners to escape rooms. This giveaway is a way of saying thanks to those readers who have been incredibly supportive of this blog’s adventure all the way dating back to 2011. Only those who like us on Facebook are eligible to win. Simply click the like button below to ensure your shot. Who’s ready for the beer? The fifth giveaway comes courtesy of Aero Plains Brewing who happen to be one of our favorite microbreweries in town. You can find them at 117 N Handley Road. We have partnered with them to give away a fantastic gift set that includes a growler, koozies, pins, stickers and a $20 gift card! This would give you a great opportunity to try my favorite, the Wingman Wheat or even the Aero Vice Rapsberry Tart which I just had for my first time. It has a strong raspberry aroma with a slight sourness to it. It was sweet but not overly done to where it was overbearing. A lot has changed at Aero Plains recently but it’s all been for the better! Now you can try it out on us. Head on over to Aero Plains Brewing on Facebook and give them a like. Then there will be a dedicated Wichita By E.B. Facebook post for giveaway pinned at the top of our page available sometime Thursday morning. Be sure to share the post, like it and comment by tagging your friends you would take for some refreshing afternoon beverages. A random winner will be selected and announced on Friday.